I’m a digital marketing apprentice, working at award-winning hairdressers Rainbow Room International. I’ve always loved fashion and beauty so being an apprentice at the Rainbow Room is amazing. Like so many young people leaving high school, I didn’t know what I wanted to do. 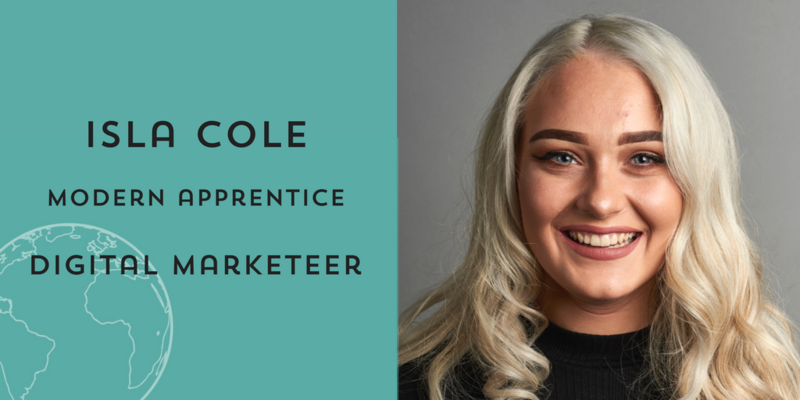 During a one-day session at Glasgow Caledonian University, I discovered that I really enjoyed learning about marketing and wanted to put this into practice by working and learning at the same time on an apprenticeship. As a digital marketing apprentice, showing creativity and thinking of new ideas for campaigns are all part of my role. I use software such as Mail Chimp to create email-marketing campaigns and different social media platforms to promote marketing campaigns, offers and news from Rainbow Room. I’m also a part of the process of creating and gathering content from other Rainbow Room salons to promote on our social media channels. Market research is incredibly important to the business and I support the process of market research by selecting candidates from our client database, reaching out to the client, sending relevant samples, creating a survey to share and collecting the data. All this work makes it easier for the salons to understand our client’s needs. As well as learning practical skills on the apprenticeship, I enjoy learning about the theory behind digital marketing and why it is so important to a business. I was able to put into practice the theory I have learnt and I take pride in seeing the positive results for Rainbow Room. Building up repeat business from clients and successfully recruiting apprentices for the salons is something I’m most proud of. Workshops and training along the way have given me more knowledge, tips and tricks to progress. Learning and developing from my employer, I have gained more experience and developed skills such as planning, communication and teamwork. An apprenticeship in digital marketing at Rainbow Rooms combines two things I love; marketing and hair and beauty. And the best thing is, I want to continue working in this industry and progress to become a digital marketing executive in the near future. So if you’re thinking about an apprenticeship in digital technology, I’d say it’s a great way of getting real experience and helps you decide what kind of job you might want.